Sonic and ultrasonic weapons (USW) are weapons of various types that use sound to injure, incapacitate, or kill an opponent. Some sonic weapons are currently in limited use or in research and development by military and police forces. Some of these weapons have been described as sonic bullets, sonic grenades, sonic mines, or sonic cannons. Some make a focused beam of sound or ultrasound; some make an area field of sound. Extremely high-power sound waves can disrupt or destroy the eardrums of a target and cause severe pain or disorientation. This is usually sufficient to incapacitate a person. Less powerful sound waves can cause humans to experience nausea or discomfort. The use of these frequencies to incapacitate persons has occurred both in anti-citizen special operation and crowd control settings. The possibility of a device that produces frequency that causes vibration of the eyeballs—and therefore distortion of vision—was suggested by paranormal researcher Vic Tandy in the 1990s while attempting to demystify a "haunting" in his laboratory in Coventry. This "spook" was characterised by a feeling of unease and vague glimpses of a grey apparition. Some detective work implicated a newly installed extractor fan that, Tandy found, was generating infrasound of 18.9 Hz, 0.3 Hz, and 9 Hz. A long-range acoustic device has been used by the crew of the cruise ship Seabourn Spirit to deter pirates who chased and attacked the ship. More commonly this device and others of similar design have been used to disperse protesters and rioters in crowd control efforts. A similar system is called a "magnetic acoustic device" "The mosquito". 'Mobile' sonic devices have been used in the United Kingdom to deter teenagers from lingering around shops in target areas. The device works by emitting an ultra-high frequency blast (around 19–20 kHz) that teenagers or people under approximately 20 are susceptible to and find uncomfortable. Age-related hearing loss apparently prevents the ultra-high pitch sound from causing a nuisance to those in their late twenties and above, though this is wholly dependent on a young person's past exposure to high sound pressure levels. Some police forces have used sound cannons against protesters, for example during the 2009 G20 Pittsburgh summit, the 2014 Ferguson unrest, the 2016 Dakota Access Pipeline protest in North Dakota, among others. It has been reported that "sonic attacks" may have taken place in Cuba in 2016 and 2017, leading to health problems, including hearing loss, in US and Canadian government employees at the US and Canadian embassies in Havana. Some events as reported would seem to violate the laws of physics, and it has been suggested that they are in fact an example of mass psychogenic illness. Cuban investigators have reportedly dismissed claims that sonic weapons have been used against American diplomats, describing them as "science fiction". The US issued an alert to its employees in China after it learned of a possible "sonic attack" on a US citizen working there. The employee complained of symptoms from late 2017 through April 2018 , then returned to the US and was examined by a doctor who said the person had suffered a mild traumatic brain injury (MTBI). The US diplomat likened it to the incident which they say happened in Cuba. In early June, 2018 several employees were evacuated from their work in the U.S. Consulate offices in China and sent back to Pennsylvania for testing and diagnosis after sharing similar concerns. Studies have found that exposure to high intensity ultrasound at frequencies from 700 kHz to 3.6 MHz can cause lung and intestinal damage in mice. Heart rate patterns following vibroacoustic stimulation has resulted in serious negative consequences such as atrial flutter and bradycardia. The extra-aural (unrelated to hearing) bioeffects on various internal organs and the central nervous system included auditory shifts, vibrotactile sensitivity change, muscle contraction, cardiovascular function change, central nervous system effects, vestibular (inner ear) effects, and chest wall/lung tissue effects. Researchers found that low frequency sonar exposure could result in significant cavitations, hypothermia, and tissue shearing. No follow up experiments were recommended. Tests performed on mice show the threshold for both lung and liver damage occurs at about 184 dB. Damage increases rapidly as intensity is increased. The American Institute of Ultrasound in Medicine (AIUM) has stated that there have been no proven biological effects associated with an unfocused sound beam with intensities below 100 mW/cm² SPTA or focused sound beams below an intensity level of 1 mW/cm² SPTA. ^ "infrasound - The Skeptic's Dictionary - Skepdic.com". skepdic.com. Retrieved 29 September 2017. ^ Tandy V. & Lawrence, T (1998). "The ghost in the machine". Journal of the Society for Psychical Research (62): 360–64. 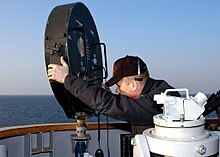 ^ "Cruise lines turn to sonic weapon". BBC. 2005-11-08. Retrieved 2010-09-30. ^ "Focused Sound 'Laser' for Crowd Control". Retrieved 29 September 2017. ^ Weaver, Matthew (2009-09-25). "G20 protesters blasted by sonic cannon". The Guardian. London. Retrieved 2010-05-23. ^ "Watch: Shots reportedly fired, 141 arrested at Dakota Access Pipeline protests". The Seattle Times. October 27, 2016. Retrieved 6 December 2016. ^ Staff and agencies (2017-08-25). "US says 16 people were affected by unexplained health problems at Havana embassy". Guardian (UK). ^ Thompson, Avery (2017-09-15). "Who and What Is Attacking U.S. Diplomats In Cuba? Several U.S. diplomats have fallen victim to an attack that experts are saying goes against the laws of physics". Popular Mechanics / AP. ^ Borger, Julian (12 October 2017). "Mass hysteria may explain 'sonic attacks' in Cuba, say top neurologists". The Guardian. Retrieved 12 October 2017. ^ Marsh, Sarah; Acosta, Nelson (25 October 2017). "Cuban investigators say U.S. sonic attack allegations 'science fiction'". Reuters. Retrieved 26 October 2017. ^ Li, Feng (2018-05-23). "US Staffer Suffers Brain Injury After 'Sound' Incident in China". Channel News Asia / AFP. ^ Jiang, Steven; Westcott, Ben (May 23, 2018). "US issues alert after employee in China reports 'abnormal' sound sensations". CNN. Retrieved 23 May 2018. ^ Doubek, James (June 7, 2018). "U.S. Evacuates Multiple Employees From Chinese Consulate Over Mysterious Illness". NPR. Retrieved 7 June 2018. ^ "Ultrasound Physics 2nd edition"; Terry Reynolds, BS RDCS; School of Cardiac Ultrasound, Arizona Heart Foundation, Phoenix, AZ; 2005. Information about a pioneer in infrasonic applications such as weaponry. Daria Vaisman. "The Acoustics of War." Cabinet, Winter 2001/2002. Gerry Vassilatos. "The Sonic Weapon of Valdimir Gavreau." Journal of Borderland Research, October 1996.